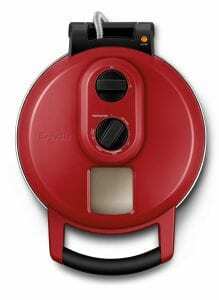 Black and Decker Pizza Oven is a quite popular as it claims to cook any pizza within 5 minutes and that in itself is a lifesaver for many college students and working people. This oven is not huge and can fit easily on your countertop without taking too much space. If you are a pizza lover and want a nice crispy home cooked pizza then you might want to take a bite into the review about this amazing pizza oven. 1. 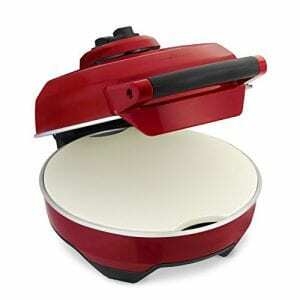 The oven can cook a 12-inch pizza within 5 minutes and this makes making a pizza really easy and quick. If you are someone who is usually on a very tight schedule or more than one job and is always on the run with no time for cooking then this Pizza Oven might be a lifesaver. 2. The oven can not just cook Pizza but also can bake other items. So if you do not want to limit yourself to just cooking Pizzas then you can try out some other recipes or use it to make evening snacks real quick in this oven. 3. The oven can fit in a maximum of 12 inch Pizza which is a pretty good size and since it has Dual heating elements, the top and the bottom element produce the perfect environment for a nice brown crust and well-cooked toppings along with the soft and gooey cheese. 4. The tray is ceramic coated which aids in giving you the perfect crispy crust that you need for a Pizza and it is dishwasher safe so you do not have to worry about cleaning it. The tray is really important to give you the perfectly cooked crust and in this case, the Black and Decker have done a really good job. 5. The Oven has a Functions Knob which can be used to optimize your baking and you have options that go from Bake, Frozen Snack, Regular and Thin, Rising and Deep Dish. The timer can go up to 30 minutes and you can time it for as long as you want, once the clock hits the timer, the oven automatically goes off. 1. One of the major disadvantages of this oven, as reported by many users, is that it does not last really long. Not everyone has had the same experience though but most of them have said that it just lasts for a maximum of two years for many consumers. Taking a good look at the price point, one can easily say that this oven is not going to break your bank and if you are using it to make Pizzas and other baked goods almost every other day then this might be a really good buy. 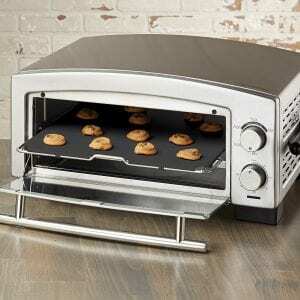 The Oven cooks perfectly and really quick making your work in the kitchen really easy. Buying the Oven is not going to break your bank and that is one of the best things I liked about it, you can enjoy a really nice Pizza Oven for a really nice affordable price. Honestly, even if it did last for just 2 years, I guess, it would still be worth the money and you should definitely check it out on Amazon. 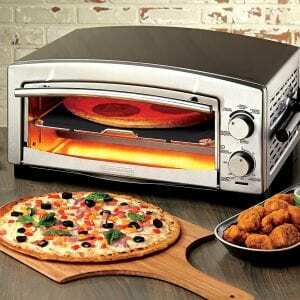 I have personally loved Pizzas and this Oven is going to do wonders for Pizza lovers who are on a Budget. Let me know if you have had any experiences with this Oven in the comments section below!